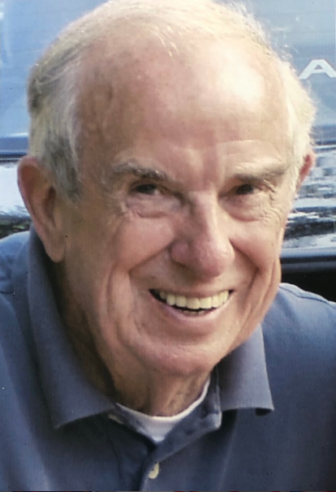 William E. Harrington, Jr. of Darien passed away peacefully on Jan. 18 after a long and fulfilling life. He was 94. William Harrington Jr., 94, passed away on Jan. 18. His wake will be on Wednesday, Jan. 23, and his funeral on Thursday, Jan. 24. Bill was born in Brookline, Massachusetts, on May 26, 1924 to the late William E. Harrington, Sr., and Alice O’Loughlin Harrington. At age six, he and his family relocated to Westchester County, New York, where he was raised. Bill attended college at his beloved University of Notre Dame and became a lifelong fan. His college career was interrupted by his service as a pilot in the Army Air Corps during World War II. After a near fatal crash during night training in Georgia, Bill spent two years in the hospital recovering from his injuries. After graduating from Notre Dame, he began his career in advertising in New York City at Young & Rubicam, where he met and married Margaret McCabe. Midway through his career, Bill became a real estate broker in Darien, as an owner of Scott Associates and later Harrington Real Estate, recently retiring at the age of 90! The Harringtons moved to Darien in 1956, where they raised five children. Bill is survived by his wife of 67 years, Margaret, and his children: Meg Levine (Jeff) of Springfield, Virginia; Beth Harrington-Howes (Obie) of Portland, Maine; Susan Hamill (Jeff) of Darien; Mary Bouton (Ed) of Greenwich; and Bill Harrington (Allison) of Glencoe, Illinois. The family grew to include 13 grandchildren and eight great-grandchildren. He is also survived by his brother Paul Harrington (M.A.) of Somers, New York; his sister, Sally Beers, of Rye, New York; and many nieces and nephews. He was pre-deceased by his sister, Joan Doyle; his sisters-in-law: Sue Harrington and Anna McCabe Murphy; and his brothers-in-law: Phil Beers, Paul Doyle, Michael McCabe, and Pat Murphy. Bill was very active in many Darien community organizations including the Republican Town Committee, the Board of Realtors (for which he was president), St. John Roman Catholic Church (for which he was a lay minister), Notre Dame Club of Fairfield County (Man of the Year), Noroton Bay Property Owners (board member and president), Middlesex Commons Condominium Board (president), Person-to-Person (volunteer), Darien Senior Men’s Association, ROMEO Club and Kiwanis Club. Throughout his life Bill carried a bright smile, however, it was its brightest while spending time with family. He lives on as an inspiration to his family and friends for his unparalleled optimism, sense of humor and loyalty. He will be missed by all for his zest for life and dedication to others. The family will receive family and friends from 5 to 8 p.m., Jan. 23, 2019 at the Edward Lawrence Funeral Home, 2119 Boston Post Road, Darien. A Mass of Christian Burial will be held at 11 a.m., Jan. 24 at St. John Roman Catholic Church, 1986 Boston Post Road, Darien. Burial will follow at Spring Grove Cemetery in Darien.